Electronic Arts suddenly and for no reason wants to make nice with Activision and Modern Warfare 3. Oh, but what a difference a week makes, particularly when it's the week following the launch of Battlefield 3. 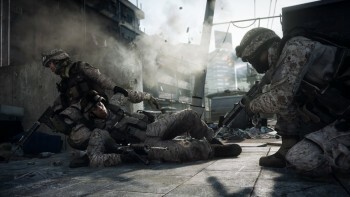 EA's much-ballyhooed military shooter did very well for itself in its first week of release, with an estimated five million copies sold. That puts it absolutely nowhere near the monster numbers of the Call of Duty franchise, which rang up seven million copies of Modern Warfare 2 in its first day. And now EA seems to be singing a bit of a different different tune. "We all respect what Call of Duty brings and what they're going to come with. Right now we're out in the market, and that's all I know. When they come out, they come out, and I wish them the best of luck," Executive Vice President Patrick Soderlund told IGN. "They're partners in this industry, and I play all their games and I look forward to many of them, and all I can do is try and make sure that people stay interested and want to have more Battlefield." Bit of a far cry from hoping the series "rots from the core," wouldn't you say? Modern Warfare 3 comes out on November 8 for the Xbox 360, PlayStation 3, PC, Wii and Nintendo DS.